You are here: Home>Towns and Villages>Hemel Hempstead>Treacle Bumpstead: The Movie. The following is being shared by Hemel Hempstead Movie Makers, Our Dacorum and Herts Memories. Although another film was picked and also made, we Hemel Hempstead Cine Society, aka Hemel Hempstead Movie Makers, went ahead with an idea, suggested by Norman Cutting, concerning a production about a local urban myth. Apparently, believe it or not, Hemel Hempstead has a nickname of Treacle Bumpstead/Treacle Bumstead. This is due to a humorous rumour that Hemel Hempstead has, or had, treacle mines in the area. Mind you, there are other towns up and down the country that also claim to have mythical treacle mines. But how does anyone go about making a film on such a subject? The problem is a sticky one. The approach made was to have an interviewer going around Hemel Hempstead and asking residents what their knowledge was on the subject. I may be wrong, but I have a feeling that Norman Cutting was thinking of genuine interviews. However, Len Osman had a comedy script typed, featuring fictitious interviews and situations. Hemel Hempstead’s major employer, John Dickinson’s, had formed in its later years an amateur dramatic club. It was named The Guild of Players. They showed interest. I was also in attendance at the meeting as an officer of our club. 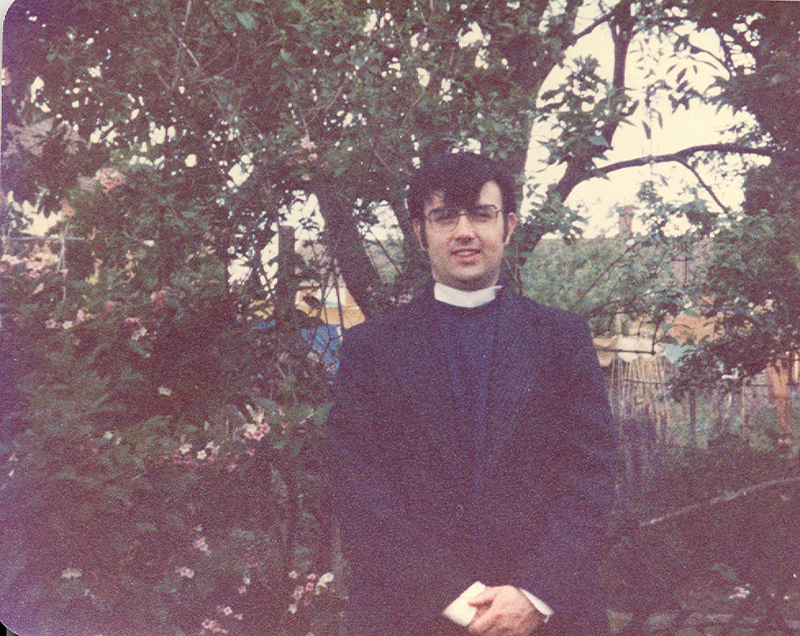 It was felt that one character who, in real life bearing knowledge on local history, would be the local vicar. I was asked would I like the part? I accepted. Hemel Hempstead Railway Station’s forecourt and grounds, close to St. John’s Church in Boxmoor, were selected for the first location filming session, using the super 8 gauge. Permissions had been granted for this. At least two men were handing out religious leaflets at the train station. They viewed me with high reverence when they saw me wearing a vicar’s dog collar. The rushes were viewed after they were developed and returned by Kodak, also another major employer at the time in the town. Unfortunately, a post-production sound problem had arose, and this meant that the St. John’s Church sequence would have to be re-done. But the weather was cold and so it was arranged for resuming shooting a few months later, when it should be warmer. A switch of churches was also made. Shooting resumed as planned. The required cast and crew arrived in the grounds of St. Mary’s Church in the old part of Hemel Hempstead. The used take that I took part in was the ad-libbed one. When completed, two amused young ladies watching asked me could they have permission to start a walk in the grounds the following week. I had to confess that I was not a real vicar. They did admit that they were a bit suspicious for a vicar to talk the way that I had. Steady progress was made over a period of time. And there was good publicity in the local press as well as our newsletter/magazine. Plus photographs! Not sure which local papers, as there were more than one at the time. About this time, Audrey Batchelor had an idea for Hemel Hempstead Cine Society to have a cheese and wine charity film show. This became an annual event for approximately ten years. Most were at Potten End Village Hall. The first, however, was at St. Benectict’s Church Hall in Bennetts End. Some films from outside of our club were shown. Oddly enough, one of our productions, ‘Dacorum Cruiseway’, was in the programme. This was the other film that went ahead instead of ‘Treacle Bumpstead’. A reader’s letter in the Hemel Hempstead Gazette wrote complimentery remarks about this film and the club’s presentation of the event. But another production surprisingly had its public premier. This was ‘Treacle Bumpstead’. Year? Circa 1980? However, in particular, the last shot of the interviewer saying a few words to the camera and then walking off was very long. Discussions every so often were made about the film. Certainly there was something there. But it was felt that the situation needed looking at. Certainly the last scene needed shortening. And did it need something else to give that little extra something? Respected member David Harrington did some minor shortening. Time was dragging on. Problems were developing for the film. Behind-the-scenes personnel Len Osmond and Harry Brelstaff had coincidentally, moved to Norfolk. Jim Swindles (pardon spelling) who portrayed the interviewer, we understood, had also moved district. So what could we do? A competition was held for the best suggestion. A long-trusted serving original member, John Pewsey, decided on the the best idea. Modesty prevents me naming the member who won a super 8 film cartidge. OK. It was me. No! I did not bribe him! Integral part what followed relied on folk dancing. I was recommended to a Mrs. Anderson of The Hemel Hempstead Dancers to perform the fictitious Treacle Miners’ Jig. I also, as a courtesy, wrote to Len Osmond, informing him of what was happening. I also wanted, if he approved, to make some minor adjustments to his part. He wrote back and said that I could. I also wanted the completion of the film to remain in keeping with showing certain parts of Hemel Hempstead which had been another train of thought for the film. Certainly in Len Osmond’s part. Apart from some rostrum camera work, by me, on a Nikon R8, of some still images, Paul Betts did most, if not all, the location work one Sunday during the summer of 1984. I am not sure if, for compatibility reasons, Paul used my camera or his own. We were in a small area in Gadebridge Park. Some members of the public were watching; this small group became extras. I also quickly donned a straw sun hat, casual jacket and a dog collar and reprised my role as the vicar by joining them. With the progression of time, I eventually completed the required post production. Norman Cutting, who had by now left us, was invited to the premier at our club meeting, in our then hall at Gadebridge. The dancers were shown it during their rehearsals in St. John’s Hall in Boxmoor. I also acquired permission from the club to show it somewhere, for personal reasons. I recall, years later it was shown at a club meeting, in which we looked into our film archive. But, other than that, the production has hardly, if at all, been shown. Recently, there has been some talk of someone baking a Treacle Bumpstead cake, in conjunction with a visit from our twin town Neu-Issenberg in Germany. I have also heard that Treacle Bumpstead was discussed on a local radio station. Hemel Hempstead has also been called Camel Bumpsted. There has also been a recent book published, titled ‘The Boy From Treacle Bumstead’. But the big twist in the myth comes with a book ‘Tales of Hertfordshire’. Oh dear! It appears the term might have come from people saying that the people of Hemel Hempstead have Treacle Minds. Cheek! Irrespective of which spelling is used for Bumpstead, the subject can be fun. Vicar and article copyright Alan French 2014. This page was added on 02/05/2014. Many years ago my mum worked in the telephone exchange in Lower Kings Road, Berkhamsted and I remember her telling me that’s how they referred to Berkhamsted. Just as a curiosity our telephone number in Hemel was Boxmoor 6562 and her number when a child in London (pre-War) was Mayfair 6562. I only found this out in the 80’s. I moved back to Berkhamsted in 1978 which was when I left the Cine Society but now in Leicestershire since 2016. PS I still have ‘Hemel – our town’,’ Aldbury Gateway to the South’ and ‘Travellin’ man’ films .